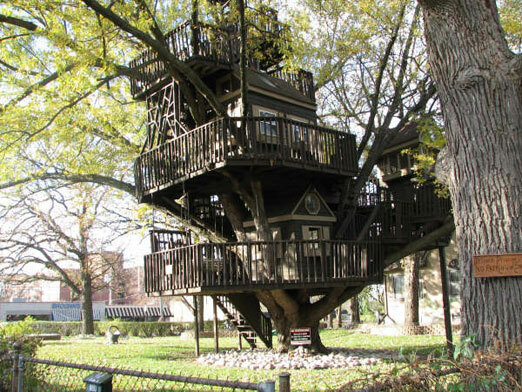 A structure that got national attention back in the 1980s was an elaborate, seven level tree house built in the back yard of insurance salesman and residential property owner Mark Tucker. The address is 4800 Minnetonka Blvd. The photos below were provided by Mr. Tucker. Information for this page comes from a story in the October 14-20, 1987, issue of the Twin Cities Reader, written by Jim Leinfelder, an Associated Press story dated September 6, 1987, written by Tom Krattenmaker, and the file of the late Mayor Lyle Hanks. Back in 1974 Mark Tucker had promised to build his son Ross a tree house. He did not. Ross became estranged and left home at 16 to live with his grandmother. In an attempt to reconcile with his family, Tucker, who had become a born-again Christian, finally began building the promised tree house in 1986. The Associated Press quoted him as saying, “I was just so busy with my business. I felt real guilty, like I had let him down… I wanted to build a tree house to end all tree houses, to totally blow away everyone in town.” The structure, named Ross’s Lookout, included electricity, phone service, and an insulated “branch” office. Tucker had put in 2,000 hours $15,000 in materials, and $3,000 worth of electricity into building the structure. When a St. Louis Park citizen asked the City Council why he had to get a permit to build a deck while Tucker was building his structure without one, the city took a look. Inspectors decided that it was indeed a structure, and as such had to meet certain code requirements as to the width of the stairs, height of support beams, safety features, etc. The building was condemned by the inspection department and the City Council voted 6-0 to order it razed unless it could be shown to be structurally sound. Tucker fought back by holding an open house on September 7, Labor Day, 1987. He had contacted the media, and everyone showed up on a slow news day. Tours were given at $2 a head, and as many as 80 people were in the structure at one time. Over $3,000 was raised for the tree house defense fund. 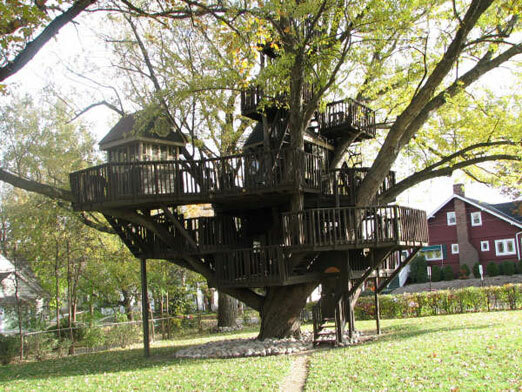 A petition supporting the tree house gathered 1,700 names, according to the New York Times. Various news reports generally portrayed him as a well-meaning homeowner who just wanted to build something fun for his kids. The Associated Press, UPI, and CBS News picked up the story and it went national. Letters from all over the country came to city officials telling them to mind their own business and quit picking on him. And worse. One Larry H. Russell even wrote a poem chastising the city fathers. The major concerns and complaints are the noise, the traffic, and that M. Tucker has found a way to profit at our expense. The peace and quiet are shattered daily by M. Tucker’s incessant hammering, sawing and loud music. Some days beginning before 7:30 am and continuing until 11:30 pm some nights. When neighbors have complained M. Tucker has either ignored them or hung up on them. Our privacy is violated daily by people and cars flooding into our neighborhood. Sunday “open house day” is the worst, forcing some residents to leave their homes because of the sightseers. The constant traffic, cars turning around in or blocking our drive ways is making our narrow two-way street even more hazardous. Again when M Tucker was told that if these “fund raisers” were to continue that the neighbors would be angry, he ignored us and our rights. M. Tucker’s arrogant additude (sic) towards us (his close neighbors) and his flagrant disregard of city codes and ordinances is setting a very dangerous and corrosive precedent in our community. In November 1986 he ignored a housing inspections order to repair one of his properties, and Hennepin District Judge Steven Lange decided that Tucker “had not taken the previous 13 very seriously. ‘We need to get his attention. '” Tucker was sentenced to 90 days in jail and a $700 fine. 80 days and $600 of the fine were suspended on the condition that Tucker avoid further violations. Tucker had acted as his own attorney and blamed his conviction on the publicity of the tree house fight. Tucker spent 10 days in the Workhouse. 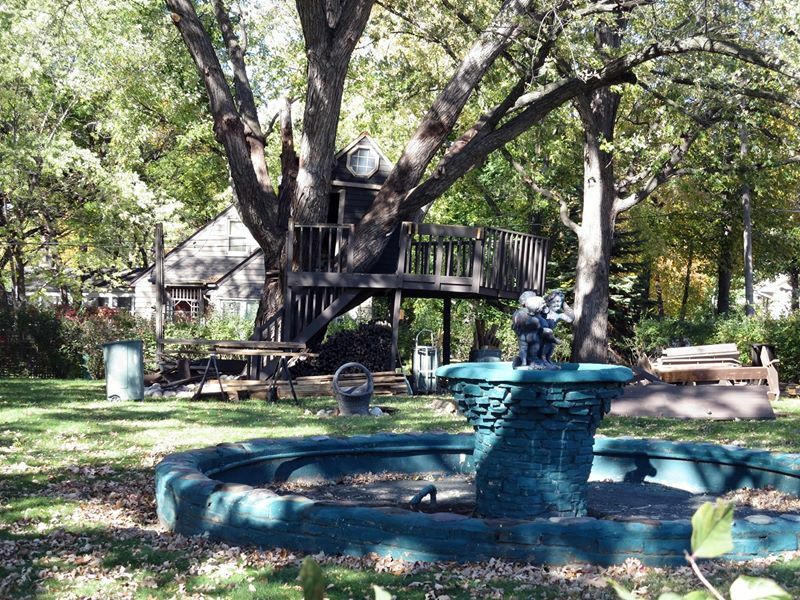 After 10 months of court cases regarding the tree house, on February 8, 1988, Hennepin County Judge Daniel R. Hart issued an order that allowed Tucker to occupy the structure, but with limitations. The court required modifications to the ladders in the upper levels, safety cages, hand grips, and regular inspections, including inspections by a forester regarding the health of the 40-foot maple tree. Tucker could not expand the tree house, but could do finishing work. Although Tucker had been giving tours, it closed for tours many years ago. Pictures could be taken from the public sidewalk bordering the property. 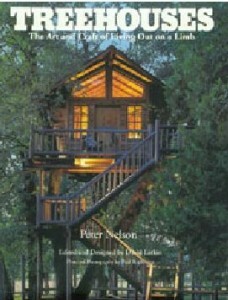 Over the years the tree house has been a visual fascination to people of all ages. Since construction began in 1986 it is one of the most photographed point of interest in the City of St. Louis Park. 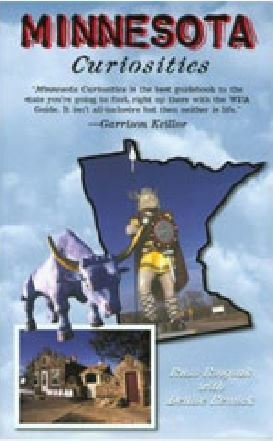 This local landmark has been featured in several publications, such as the books Treehouses by Peter Nelson; Minnesota Curiosities by Russ Ringsak and Denise Remick; and Black & Decker’s book entitled Build Your Kids a Treehouse. Neighbors used it as a landmark to guide visitors to their homes. City residents cited it as one of St. Louis Park’s few tourist attractions. Old and young alike were reminded of treehouses of their childhoods with fondness. Part of the treehouse tumbled down on April 1, 2014; see a news story Here. Presently cleaning up the part that came down (left side) with the April Fool’s Day snow/wind storm. 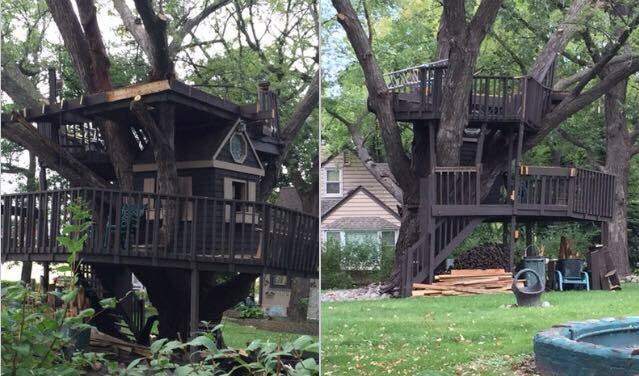 Fortunately, with a little repair, the 2 houses (right side of the picture) and the decks above, will continue to stand for many more years (hopefully) to come so that kids of all ages can continue to enjoy the fascinating views of The St. Louis Park Tree house at Minnetonka Boulevard and Ottawa Ave. South. Perhaps the only serious contender for the title of most beloved tourist attraction in our fine city of SLP whether you are age 4 or even up to age 104 which actually was the age of our oldest visitor Ms. Lilly Royce, who was the mother of our well known longtime resident Elliot Royce who paid a visit to the tree house together way back in the late 1980s. I think most all children regardless of age or adulthood love to dream or imagine just for a moment about living or just hanging out in an interesting tree house such as this one. This has perhaps been the real magic of this wonderful SLP landmark over the many years since 1986. 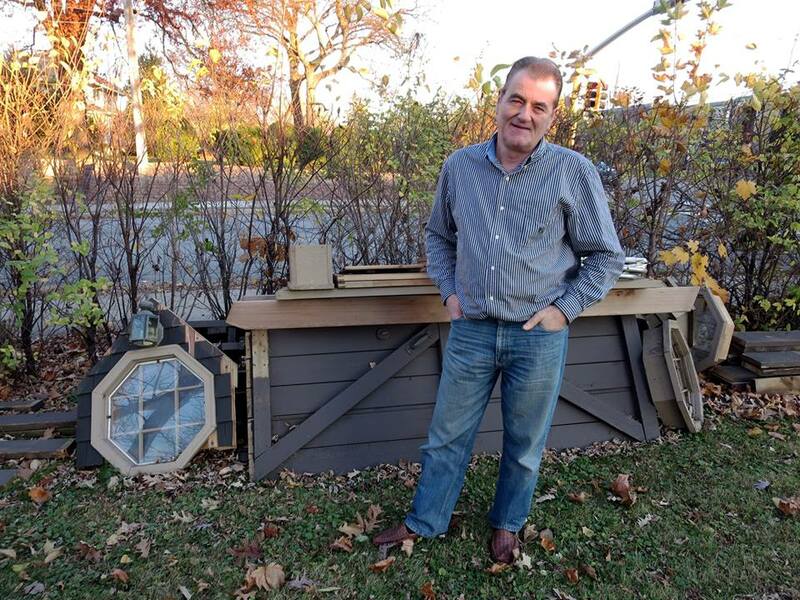 – (Mark Munroe Tucker is affectionately known and remembered as being “Out on a Limb Without a Permit” – or – simply “The Tree house Man” of St. Louis Park!) CHEERS!! 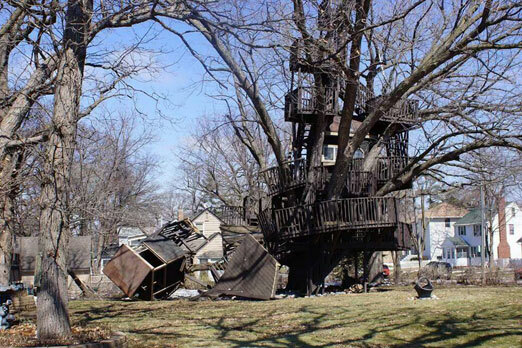 Although Tucker had hoped that his tree house would be his enduring legacy, the time came for it to come down in 2015. He had more and more trouble keeping it up to code, and the City gave him to the end of the year to take it down. He sadly began demolition, all by himself, just as he had built it. See story from September 26, 2015 by the StarTribune. Getting shorter; October 14, 2015. Photo by Emory Anderson. Tucker took the last board down on October 31, 2015. On November 7, 2015, he offered souvenirs on Craigslist and Facebook. He generously donated a window from the main house to the St. Louis Park Historical Society, which will be put on display when the Society establishes museum space. Mark Tucker with our new window (left), November 7, 2015. Photo courtesy Emory Anderson.